A scene with a character portrayed as an Ottoman Sultan of 1498–99, from 'Khusrau and Shirin'. Metropolitan Museum of Art, New York, 69.27. 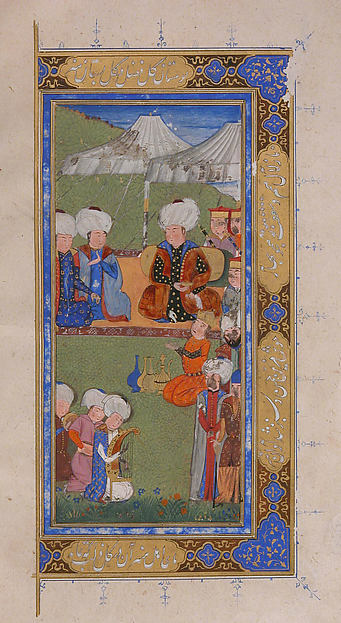 A larger image of a scene with a character portrayed as an Ottoman Sultan of 1498–99, from 'Khusrau and Shirin'. Metropolitan Museum of Art, New York, 69.27. This manuscript is a copy of the tale of Khusrau and Shirin composed by the Persian poet Hatifi, and shows the importance of Persian literature in the Ottoman world. It contains seven paintings, executed in a distinctive style, related to western Iranian tradition from the Aq Quyunlu, but also borrowing elements from European sources. The calligraphy, illumination, gilding, and painting were completed by a single artist calling himself Suzi ("the burning one"). Next: Khusrau riding on Shabdiz, his beautiful horse, while hunting, from 'Khusrau and Shirin', A.H. 904, (1498–99AD), Ottoman.